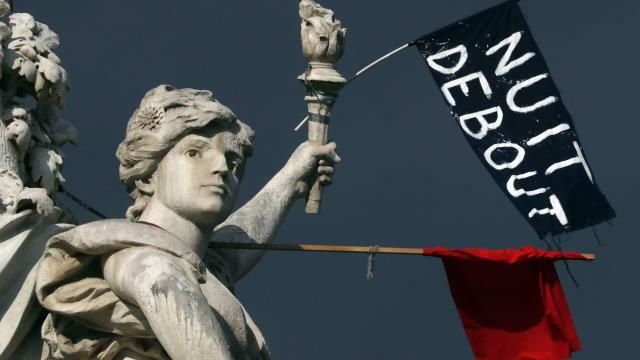 Home » Nuit Debout: Soros and "Revolution"
On the contrary, it is the result of decades of careful policy analysis by US imperial ideologues. Since the undemocratic dissolution of the USSR in, 1991, the United States has perfected a regime change technique commonly referred to as ’colour revolutions’. The strategy involves co-opting leftist slogans and symbols to serve a right-wing agenda. Lenin and the Bolshevik party had repeatedly denounced Leon Trotsky for utilizing this counter-revolutionary technique both before and after the October Revolution. It has now become a standard tool of US foreign policy. Perhaps this explains the ambiguity of the Nuit Debout´s claims. On this image taken during the demonstrations, we can read a sentence as absurd as “Neither capitalism nor anti – capitalism! Citizens!“. It is important to pay attention to Plenel´s relationship with PILA, an “international mailboxes network for leaks” where, besides the director of Mediapart, collaborators include Gerard Ryle, who is nothing less than the director of the International Consortium of Investigative Journalists (ICIJ) – an “independent” journalistic group who has risen to fame thanks to the spread of the so called “Panama Papers” and as you already know, are funded by George Soros´s Open Society Institute and by the Ford Foundation. “Wow! four French journalists working for the Soros´s Consortium, and it turns out that at least two of them are linked to Mediapart, one to France 2 and the other is a freelance. He is the co-director of the film “Comme des Lions” (“Like Lyons”)… Interestingly, this film was recently screened during “Nuit Debout”. But maybe we should approach to the editorial line that such “alternative” media has maintained on recent years. Then we will observe several amazing facts around Mediapart. “Popovic is often presented as the inspirer of the “color revolutions” in former Soviet satellites, which in fact sometimes refer to Otpor!. But also as “the secret architect” of the Arab uprisings, due to the organization of various workshops a few months before the revolution of January 25, together with activists of the “April 6” Egyptian movement, which led the anti-Mubarak struggle, including Mohamed Adel, now imprisoned. Beyond the exaggerations, while acknowledging that “all parts of the world are different” and that “non- violent movement in country A can not be a simple copy and paste to country B” Serdja Popovic proposes in addressing the issue, complex but exciting, to know under what conditions, to what extent and how a revolutionary movement can be organized and distributed. “In my work, I am especially interested in the value of the human being. When I play any political subject, I am very careful to make sure that I can handle their interpretation” says Sergii Radkevych. In response to the deaths committed by snipers in Maidan, who had fired on the crowd on February 20, 2014, killing 75 protesters on the Independence Square in Kiev (…) the artist painted a series of icons to the morgue in the form of peepholes and coffins. He says: “I started the RIP series after the first three deaths of protesters during the revolution. It was so painful that I wanted to throw my feelings against the wall. Maidan was a communion of society had never seen before in my country, where many people helping each other. Times were tough, but we tried everything to take over the defense of our ideas. This period was a very important influence in my painting. After the revolution, I tried to connect my experience of sacred art with the situation in my country. It is essential in order to respond to the reality that we live today, be as honest as possible. “What is the artistic situation in Ukraine today?” We have a big problem with the department of culture and institutions. But above all, we have seen a very strong activity in the art scene has also made significant progress this year, so many Ukrainian artists have created a powerful political and social work. The problems we are experiencing now offer us better subjects and better reasons to create. The situation is bad now. We face the same problems with the government: corruption, theft of money. But I believe in the coming of better days”. Also surprising is the interview with Mustafa Nayyem, also EuroMaidan activist, where he is described as a moderate and independent journalist. Here we can see the “moderate” Mustafa Nayyem visiting his admired compatriots in the“Azov Battalion“. They are famous for not hiding their neo – Nazi tendencies (See the original link here). Again an interview with a Russian- language writer who proudly confesses to be in favor of the “Orange Revolution” in Ukraine and of course, in favor of EuroMaidan… All of this while strongly condemning Crimea’s secession. “His first published novel, The Penguin, was a success bestseller, and with it, Andrey Kurkov imposed his style, a blend of realism with absurd humor painted in a transition of a post-Soviet society. He told the story of a journalist hired to write early obituaries of people who later disappeared mysteriously, always accompanied on his travels by a penguin recovered at the zoo in Kiev. Since Kurkov’s work was translated into 36 languages, he became the Russian- speaking writer best known abroad today. In the “Last President´s love” he portrayed an image of Ukrainian politics and the corruption, with some foreboding, heralding the Orange Revolution… In his latest book translated into French, the outfielder Ochakov, staged a young Ukrainian who, through a suit militiaman, is transported as soon as approved by the year 1957, in the small town on the bank of Black Sea, to Ochakov, a coastal town near Crimea… an interview with a writer who participated in the Maidan demonstrations and retains, despite their concerns, a profound optimism about the evolution of his country”. But most surprising of all is the sympathy which Mediapart welcomes the struggle of Vasyl Cherepanyn: he wants to convince to the Spanish activists that they must support to EuroMaidan militants, despite the fact that they want to join to the European Union and among them there are many Nazis. Cherepanyn, also teaches at the University of Kiev-Mohyla. He says: “We had a parliament that was not a real parliament. We had a righteousness that was not true justice. It was all pretense and artifice. The idea of Europe was used to demand democracy. It is a certain idea of Europe that we defend, which goes far beyond what are some of the European institutions. A native of western Ukraine, Cherepanyn also runs a cultural center, which he describes as “a platform that brings together since 2008, artists, academics and activists” which was very involved, like many other structures, on the “EuroMaidan” since November. He acknowledges often feel at odds with the discussions that took place in Madrid, in the techniques of resistance to austerity, and the role of culture against the crisis: “Activists here only speak about neoliberalism and financial capitalism. But the enemy can be different: Here one also wants to talk about neo-feudalism or savage capitalism… “. Above all, Cherepanyn insists, “dismantle the Kremlin propaganda, and the damage it does to understand what is at stake in Ukraine on the importance – relative to their eyes – of the right- wing militias on Maidan. Or in the division between “two Ukraines, one pro-European and the other pro-Russian”: “This does not exist, or rather, it is much more complicated. If Yushchenko failed in his time (…), it is because he has betrayed the social expectations of citizens. The problem of Ukraine is not the EU, not Russia. They are citizens who fight against the oligarchs. Despite what Russian propaganda says, because they have an interest in an escalation in the region, imposing their agenda.” …”. While Moscow intervened militarily in Ukraine, this Maidan activist still maintains the hope of a revival of European people. “Governments have for months expressed their “deep concern”… That did not cost them anything, and now they have to take action. And it is necessary that European citizens press their governments “, which offers hope, betting on the demonstrations in Ukraine and the European Union. “This exciting reading of the crisis in Ukraine does not dislike to Cherepanyn, who remembers the Turks and Arabs origins of the word “Maidan” (“square”). “As an activist in Kiev, I try to include the Maidan movement in an international context of social movements. Our repertoire borrows concepts from both the Arab revolutions- the rejection of those who hold power- the Spanish indignados- the fight against corruption- or the Occupy movement in the United States- about how we occupy a square. “The models are circulating”, he confides. Would, therefore, at this point, less misunderstanding which seems: the future of Europe is at stake in its permeability to the outside”. Well, it seems that Edwy Plenel, friend of the French occupy movement, has not yet learned that Otpor! works for the CIA, and that the Euromaidan “revolution” was fabricated from the very beginning by the United States with the help of paramilitary fascists.